July, the summertime is just about to bloom. Open air music festivals, summer festivals, beach resorts, beer gardens, all those fun events and activities are on the list. On top of anything, fireworks festivals are something you should never miss out. Watching fireworks have been a popular summertime entertainment of Japanese people sine the old times: there are many Ukiyoe, woodprint pictures created during the Edo period, portraying crowd letting out a cheer for blooms of fireworks. In modern days, many fireworks festivals are held all over Japan during July and August to display all kinds of elaborate fireworks that are visually auditorily spectacular. The followings are fireworks festivals held around Tokyo that you can visit by train. The history of Japanese fireworks cannot be explained without mentioning this event. It is the oldest firework festival of Tokyo which origin can be traced back to the Edo period. It is also one of the largest fireworks events in Japan with about 20,000 fireworks launched. This event is so big that it is held in 2 locations. A competition is held at Site 1 to display exquisite fireworks created by professionals and loads of original fireworks and star mines illuminate the night sky at Site 2. Literally, almost a million people stream into the area on the day, which is equivalent to population of a middle sized city, therefore a huge congestion is naturally expected. Spectators will be following a series of arrows while watching fireworks. It is going to be overwhelming for first-timers, but definitely worth watching while staying Tokyo during summer. This year is the 50th anniversary of this event, the number of fireworks is specially increased to 15,000 as well as the time extended by 10munites. Held at the Shibamata baseball ground, two of must-see works are featured this time: Tokyo’s first Fireworks Tower and the award winning original fireworks that is specially arranged for this event. The fireworks will be shot off near the viewing spots so that you might even feel the blast of explosion. This event is one of the most popular fireworks festivals in Tokyo, attracted 630,000 spectators last year. Also, this area is the old downtown of Tokyo city with the good old atmosphere. The Shibamata Taishakuten, the Shibamata Park and the Tora-san Museum are good places to visit before the fireworks. Yokohama, the city accommodates the second largest population in Japan. Held in Minatomirai, where many of landmarks of the city are squashed in, the Kanagawa Shimbun Fireworks Festival is one of the most popular fireworks events in Kanagawa. Repeatedly shot “shakudama (large size firework)” and star mines illuminate the night sky of Yokohama city. In recent years, it has been known for the endless shot of fireworks at the finale, well actually, you can’t tell when the finale is. All the sightseeing highlights of the city such as Nippon-maru, Yokohama Red Brick Warehouse, Cosmo Clock 21 and China Town are located within walking distance. What makes this event so popular is handy access from Yokohama city after visiting those sightseeing points. This is a highlight of the largest outdoor event of Atsugi city, the Atsugi Ayu Festival. The fireworks are launched out from the junction of three rivers, Sagami River, Nakatsu River and Koayu River. The viewing points are located close to powerful fireworks. The event finishes with the great Niagara after many of star mines. 10,000 of fireworks will be launched one after another. This is such a popular event, so hurry if you want to book seats. This year, the annual Makuhari Beach Fireworks Festa will display a special program featuring fireworks launched with the local dancing music and other original fireworks. In addition, many more attractions will come up in the show, such as love message fireworks, “shakudama (dia 30cm)” fireworks bursting at 330m from the ground and endless star mines launched from the sea. 15,000 of fireworks are shot off during an hour event. In addition to free viewing spots, paid seats are available on the beach nearby the launching point. Seats can be booked on the official website (Japanese). This is the popular grand finale event of the annual Funabashi Festival. An endless number of fireworks are launched in a specific theme and create a beautiful collaboration with music in the air every year. This year, it is themed on “Funa-lympic, one night festivity of sports”. About 8,500 fireworks will be shot off into the night sky to express sports such as swimming, martial arts and many more. Paid seats can be booked beforehand or purchased on the site. Fireworks are launched from the golf field nearby Arakawa River which runs through Ageo city, Saitama prefecture. Powerful explosions of fireworks including repeatedly shot “shakudama” and message fireworks gradually became popular. This event is now attracting thousands of spectators from inside and outside of the city. Viewers will be watching fireworks from the other side of Arakawa River as there is no paid set available. Another attraction is a number of night stalls standing around the site on the day, creating summer festival like atmosphere. Arriving the site in good time to look around the stalls before viewing powerful fireworks with delicious snacks, this is the best way to fully enjoy this event. Travel 15min by shuttle bus (fees apply) from Ageo Staion (JR) to Hirakata Primary School bus stop, walk another 10min. Not limited to the events introduced in this column, there are many more large and small fireworks festivals held all over Japan in July and August. 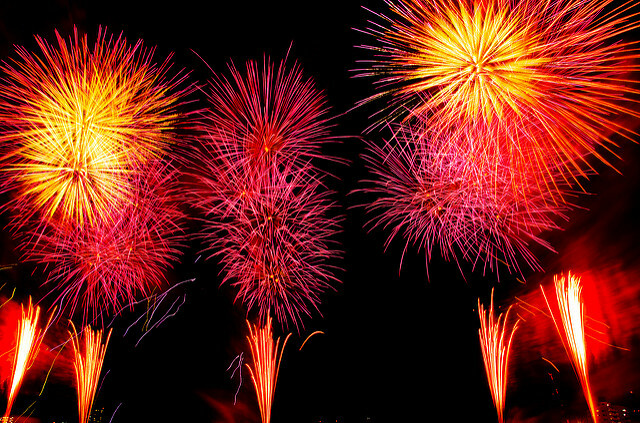 There must be at least one fireworks event in your area, why not go out and enjoy viewing sparkles in the sky. By the way, roads are closed during large sized festivals as huge congestions are always expected. Make sure to allow plenty of times to get in and out the event sites as all public transports will be over crowded as well. Living outside Japan for a good many years, I often rediscover nice little things about this country every time I return here. I would be more than happy if this column may help you find your "nice little things about Japan"!